Whilst most of our work involves large ponds, lakes, rivers, streams and other natural watercourses, we do offer a pond cleaning and maintenance service. This is often required in domestic ponds as organic waste can accumulate with no way of being processed out of the pond. These smaller ponds are also more susceptible to changes in water quality and can quickly deteriorate causing the loss of fish and the pond to have a rotten smell. We offer a full cleaning service for domestic ponds and we can usually offer replacement products such as liners, filters and pumps. 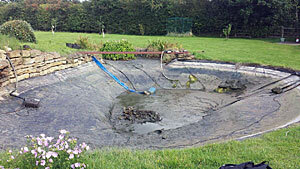 We often hear from owners of lined ponds who have unfortunately got a leak in their pond, in many cases, depending on the condition and material of the liner, this can be repaired, and the pond returned to a full working order. We can offer an appropriate selection of native and ornamental pond plants, we can supply ready planted baskets of attractive plants for instant results. We offer a supply only, or a supply and plant service. Many of our customers prefer an annual service package that will allow for the filters to be cleaned, excess weed or marginal growth to be removed, air stones to be replaced and UV bulbs replaced ready for the summer season. This service is available for indoor and outdoor ponds and as well as gardens, we maintain ponds in offices, formal landscape feature, town centres and countless other locations. 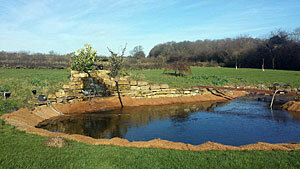 If you have a lined pond you wish to have cleaned or restored, please contact us to discuss your requirements.